For African women in the reserves, where they soon began to outnumber the men, life was very tough. The burden of agricultural work and the responsibility of keeping the family together fell entirely on their shoulders. Many African women began to consider the alternative of moving into locations near to the towns. This provided the opportunity to take in laundry or opt for employment as domestic servants. However, it suited the government better to have African families living in the reserves so the women who moved to the town were confronted by government influx control measures. In the towns women also grew more independent and assertive; they became more politically aware and less compliant with the harsh, discriminatory restrictions placed on them by officialdom. In each of these episodes women reacted not because of major political issues or broad developmental policies, but because the stability of their homes and families were in jeopardy. As Julia Wells puts it: ‘When it was women who resisted, it was because the crisis reached into the inner sanctum of home and family life. Each of the three [episodes of resistance]”¦ reflects a time when women themselves were directly and negatively affected by shifts in the application of the pass laws' (Wells 1993:9). The women involved in this incident were an urbanised group living in the Waaihoek Location under the control of the Town Council of Bloemfontein. In 1913, partly as a measure to protect the increasing number of ‘poor whites' from black competition in the labour market, government officials in the Orange Free State declared that women living in the urban townships would be required to buy new entry permits each month. It was claimed that this would cut down on informal means of employment such as laundry work, illegal beer brewing and prostitution. Each month, when renewing her permit, a woman had to prove that she had ‘legal' employment. All ‘informal' employment was thus restricted, forcing the women to take on domestic work in Bloemfontein, which suited the ruling party, and which took the women away from their own homes and children. Those who refused to comply would be evicted and sent back to the reserves. Furthermore, there were allegations of sexual abuse related to the enforcement process by both white and black constables. In an angry response to these prescriptive measures the women sent an all-woman deputation to the governor-general. They collected more than five thousands signatures on petitions, and organised impressive demonstrations to protest the permit requirement. Both the newly formed ANC and the African Political Organisation (APO) formed in 1902, under Abdurahman, gave encouragement to the efforts of the Waaihoek women. Abdurahman was a great admirer of Gandhi’s passive resistance and he encouraged the women to invite arrest by defying the hated regulations. African people across the board also felt bitter and disappointed about the recently passed Natives Land Act (1913), so tensions were high. Unrest spread to other towns throughout the province and hundreds of women were sent to prison. Civil disobedience and demonstrations continued sporadically for several years. Ultimately, the permit requirement was withdrawn. Women had succeeded in making their voices heard and this certainly inspired them for the future. 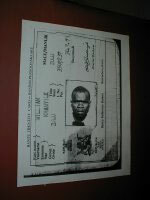 The term ‘pass' was used to describe any document that curtailed an African person's freedom of movement and had to be produced on demand by police or local officials. As far as African people were concerned residents' permits (also called ‘lodgers' permits'), special entry permits, permits to seek work and reference books all fell into the general category of the ‘pass'. Until the 1930s women were generally exempt from pass control but the Orange Free State was the exception; here there was a complex net of restrictions on African people, both men and women. Ultimately, however, all African women in the towns or so-called ‘white' rural areas and reserves were required to carry reference books, while only certain women in the proclaimed areas were subject to the permit requirements. The issue of permits in the urban areas began a few years before reference books were introduced. African women felt that the permits were simply forerunners of reference books and treated them with equal contempt. One of the direct consequences of the Bloemfontein anti-pass campaign was the formation of early women's political movements. Women had proved their ability to take their fate in their own hands. An organisation called the Native and Coloured Women's Association was formed in 1912 to lay plans for the Free State anti-pass petitions and the deputation to the governor-general. Soon afterwards it was followed, and eventually superseded by a new, very significant women's movement, the Bantu Women's league (BWL). This was formed in 1913/14 as a branch of the ANC. At the time women were not accepted as full members of the ANC, but at least the BWL made the men realize that African women were becoming assertive and politicised. The BWL became involved in passive resistance and fought against passes for black women, but it also undertook the more traditional roles of catering and entertainment for the male-dominated ANC deliberations. During this time the BWL was under the leadership of Charlotte Maxeke, South Africa's first women graduate, who had been educated in the USA. In 1918 Maxeke headed a deputation of women who went to see Prime Minister Louis Botha to plead the womens' case. Following this, the Free State regulations on resident permits for women were relaxed.